If you have a missing, chipped, weak or a discolored tooth, it may be time for a dental crown or bridge. These are non-removable prosthetics that a dentist cements on either existing teeth or as an implant. It’s worth noting that crowns are not a new technology as they date all the way back to Etruscan civilization, when they were the main option for restoring damaged teeth. Back then, ivory, gold and bones were the standard crown materials, which evolved to porcelain and ceramic in the 20th century. The material is matched to the color of your teeth, thus you do not have to worry about either a crown or bridge being conspicuous. So what’s the main difference between the two? Crowns are basically a ‘tooth-shaped cap’ usually placed over a tooth for different purposes. They either restore the tooth to its original size and shape or improve its appearance. Dental Bridges on the other hand, are used to cover up spaces left by missing teeth. This is mainly to prevent the remaining teeth shifting into the empty spaces, which causes a bad bite. Unlike dentures, crowns and bridges cannot be removed and they can only be cemented in place by a dentist. Am I an ideal candidate for a crown or bridge? 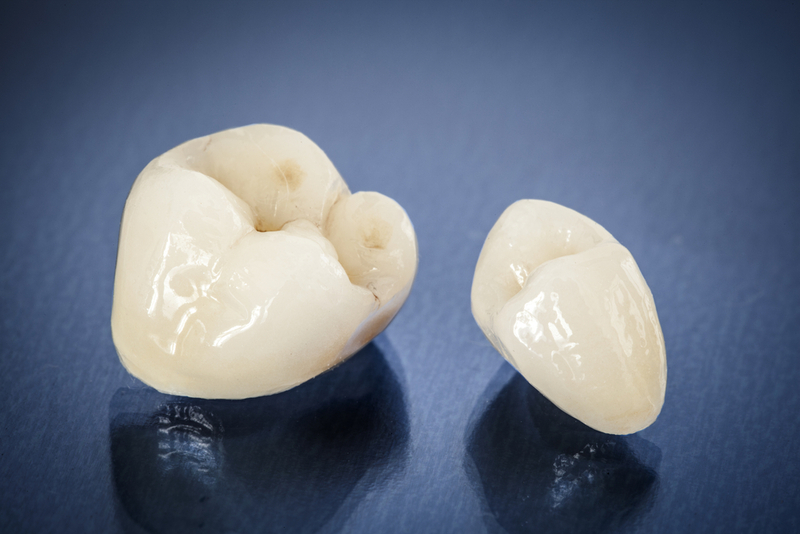 Only a professional dentist can truly ascertain whether crowns or bridges are right for you. However, there are a few signs you should look out for before your first consultation. For a crown, your teeth should either be weak, chipped or completely worn down, have a large filling, misshaped or discolored. Dr. Tyson, a Huntsville dentist may also recommend crowns as a cosmetic modification, to cover a dental implant or hold a bridge in place. Children can also be perfect crown candidates if there is a decayed tooth or to protect those facing a high risk of tooth decay. We mostly recommend getting dental bridges in case of missing teeth. Your dentist will have to use local anesthesia to numb the tooth and gum tissue around it. The next process will involve filing down along the tooth chewing surface and sides to create ample room for the crown. The space required depends on the type of crown to be used. An impression of your bite is taken, which is what is used to construct the mold for your crown or bridge. If it’s the tooth that’s missing, the dentist uses filling material that builds up the tooth to be able to fully support the crown. A porcelain prosthesis is fitted immediately, and the color is matched to the natural shade of your tooth. If you settle for a permanent crown, made in the dental lab, your dentist first fits a temporary crown on your teeth as you await permanent restoration. Are there any given post treatment guidelines? You may experience some sensitivity to hot and cold right after the treatment, which is normal as your tooth requires a bit of time to fully heal. We may also prescribe ibuprofen to reduce any soreness in the gum, which usually goes away after a few days. For temporary restoration, we recommend avoiding stick and hard foods as well as using the side with the temporary crown. This should be done until your permanent fix is available.